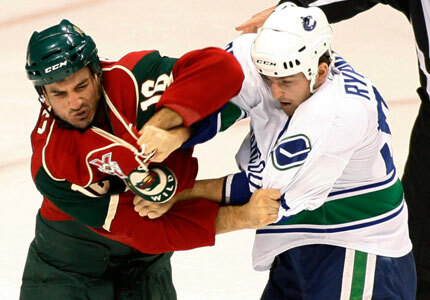 Not only was it ugly on the scoreboard tonight for Vancouver, but Canucks' forward Rick Rypien will most likely be hearing from the National Hockey League after his altercation with a fan that will most likely result in a suspension. The Canucks posted a season worst effort in a disheartening 6-2 loss, where they collapsed in the first period giving up three goals. Roberto Luongo allowed 6 goals on 17 shots, but the real story involved Rick Rypien's altercation with a fan. After sucker punching Minnesota's Brad Staubitz, Rypien was escorted to the Vancouver bench where he was corralled by the Sedins and Manny Malhotra. 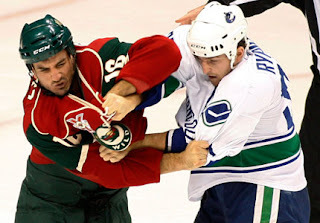 After breaking free he began to make his way to the dressing room before lunging into the stands and grabbing a Minnesota Wild fan who did not appear to obviously provoke Rypien. On his way down the tunnel to the dressing room, Rypien pushed a Wild fan who was applauding at the railing. Rypien was quickly pulled away by teammate Manny Malhotra. The fan was removed from the area. Rypien was not available for comment after the game, but Malhotra thought the fan "got a little bit too involved." "There's boundaries that should never be crossed. We're in our area of work," he said. "We're all for the hooting and hollering and supporting your team and saying whatever is tasteful. But as soon as you cross that line and want to become physical with a player then we have to make sure we take care of ourselves. ... We have no idea of what their intentions are." As TSN reports, Malhotra said the league does a good job of having proper security near the benches to keep fans and players apart. Coach Alain Vigneault said at his postgame news conference that he had yet to see a replay and had not spoken to Rypien about the incident. Rypien was in the penalty box to start the third period, but did not get any ice time. He wasn't on the bench at the end of the game. "I just sent him to get undressed with a couple of minutes left," Vigneault said. Vancouver general manager Mike Gillis couldn't comment on possible disciplinary action. "We'll wait and see how the league views it. I'm sure there will be a hearing of some sort. Rypien should get 5 games... not as bad as Artest, but worse than Domi!